A baby registry checklist is a very practical roster one can adopt. It will help organised your shopping list as well as the ones which you expect from others. This way you will be able to get the exact things that you need for the baby in the least amount of time. The goodies comes from every category ranging from bathing to clothing to feeding to even playtime and travel. You can also see Onboarding Checklist Templates. 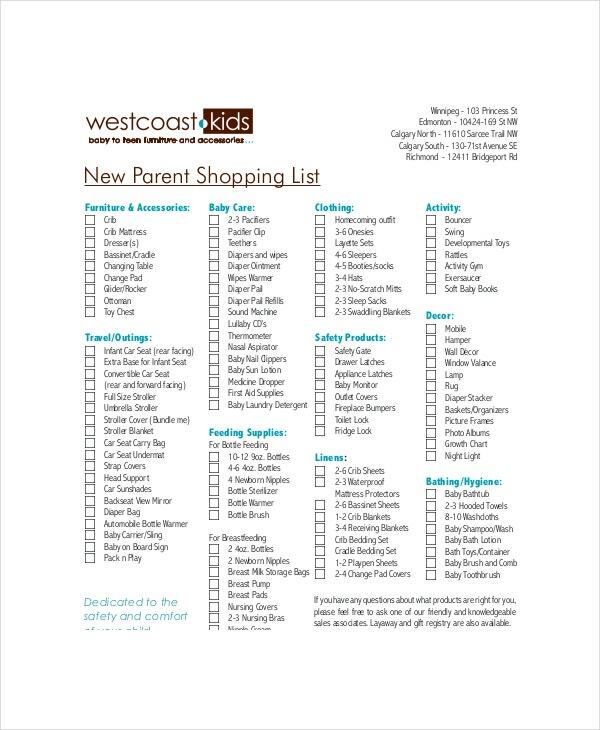 There are some Checklist Templates that include checklist for things to be bought while taking the kid out in a car. The sample checklist is usually offered by baby product shops to be filled by the would-be parents, which is further passed on to relatives- who are looking to buy the needed gifts for the little one. 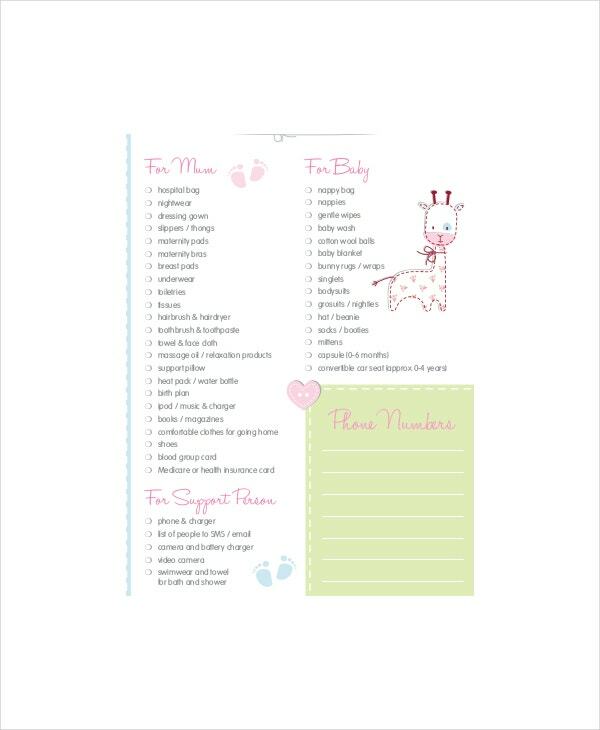 This is a very practical baby shower registry checklist. It has checklists for the pregnant mom, followed by checklist for the mom & baby at the hospital, for support person and finally you have the checklist as the baby arrives. You have an elaborate baby registry checklist here which would be helpful for new parents who need guidance on everything they need to buy for the new guest. The entire checklist is appropriately categorized. You have a super cute baby registry checklist here which includes detailed roster about the essentials for a newborn, divided into practical categories like nursery, feeding, playtime, bath, clothing and even travel. You can also see Employee Checklist Templates. 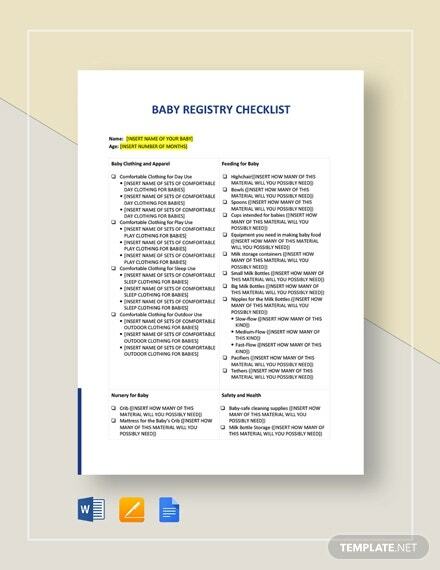 The most interesting part of this baby registry checklist is that it features checklist for not just one baby but also for twins. 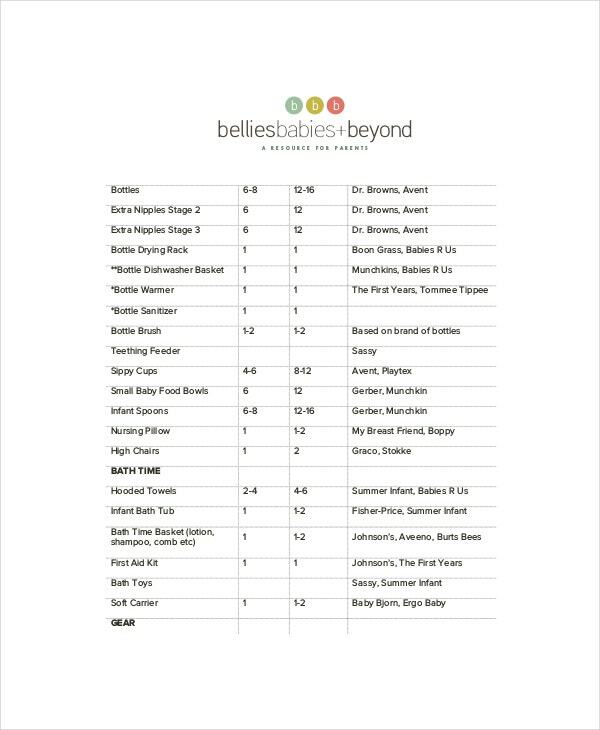 This roster features lists on all must-haves for your baby/babies for the next 6 months. 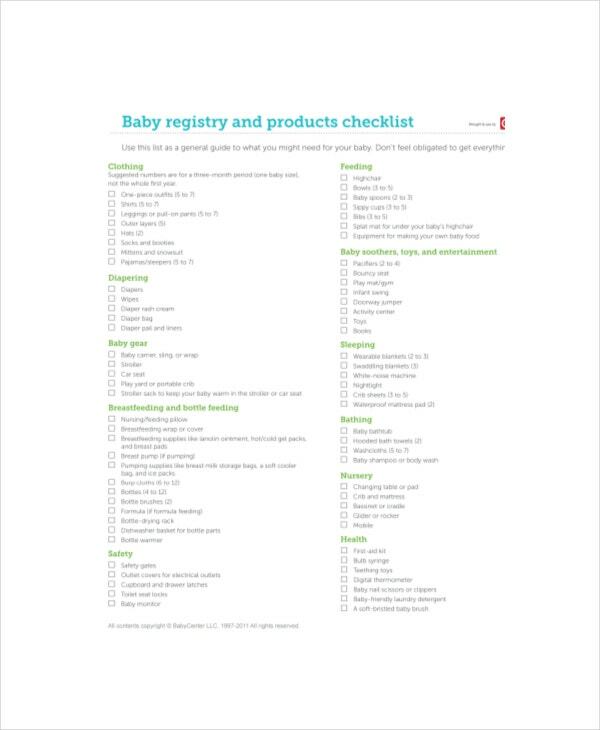 > What is the Purpose of Baby Registry Checklist? 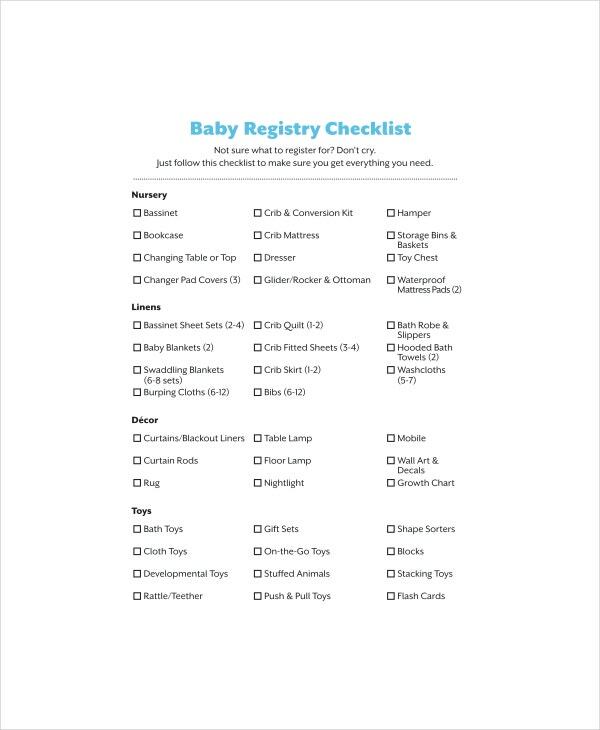 A baby registry checklist is a must have when you are about to have a baby. The main purpose of a baby registry checklist is to ensure that you have all the most needed essentials for the baby in place before the little bundle of joy arrives. This assures that everything is just ready for him or her. Another major purpose of such a registry checklist is to pass a clear idea to your near and dear ones (who are waiting to present something to the baby) that you would need for the baby. This way, they will know about your exact requirements and go to your preferred shop. You can also see Funeral Checklist Templates. > Who Would Need a Baby Registry Checklist? 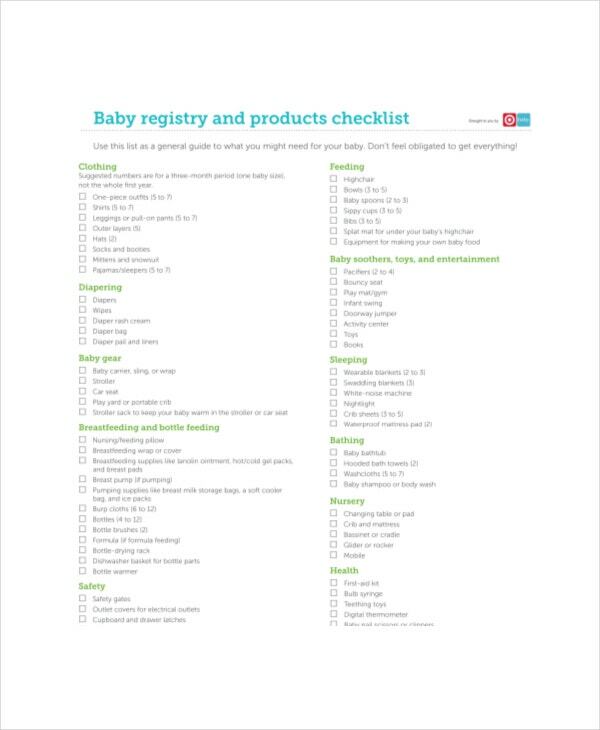 A baby registry checklist refers to the roster of things that you would need for your baby. Thus, it is natural that such a checklist would be of great use to the parents. The would be mom and dad can plan and list down the things that they wish to get for the baby so that the relatives and friends know in what ways they can help the new parents and the newborn. Apart from the parents, it’s the baby product shops that would largely need the baby registry checklists. These shops offer the ready-made checklists to the would-be parents visiting the stores where they can tick on the items they want for the baby. > What are the Benefits of a Baby Registry Checklist? It calls for a great lot of shopping and preparation when you are about to welcome your little bundle of joy to the world. 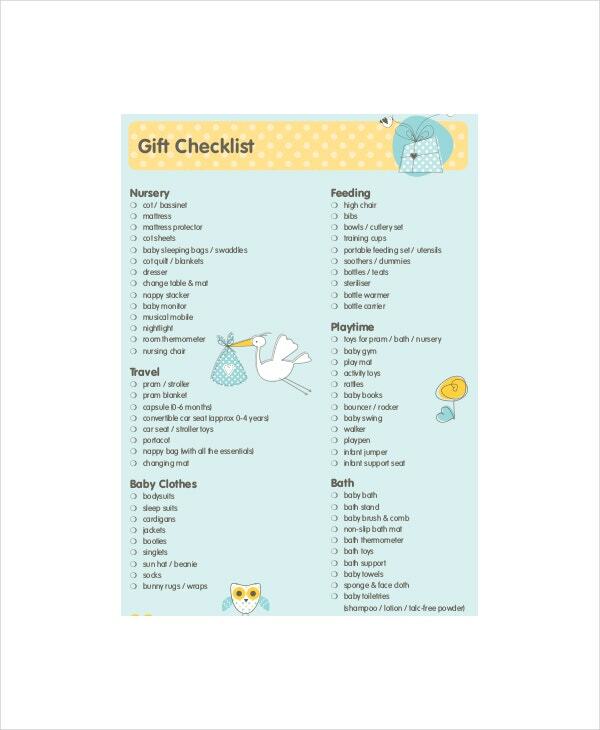 In such a situation, a baby registry checklist is a must have for all the would-be parents out there. The main benefit of such a checklist is that it allows you to clearly mention the things that you would need for your munchkin and as you pass it on to your close ones- they would have a proper idea on what exact gifts to be presented to you. The checklist is a very practical solution that guarantees you get no unwanted gift and only the most desired ones. It also rules out the chance of repetitive gifts. You can also see Student Checklist Templates. A baby registry checklist is any day an elaborate task. If you are too busy to draft the entire list or need guidance on designing the list, the best option is to go for a baby registry checklist template, like the ones mentioned above. 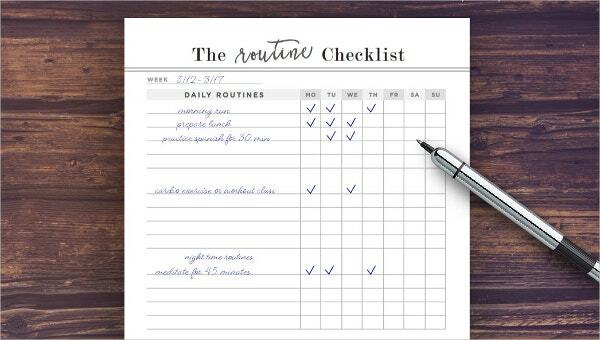 Such templates come with a ready-made and easily customizable checklist, much to your convenience.